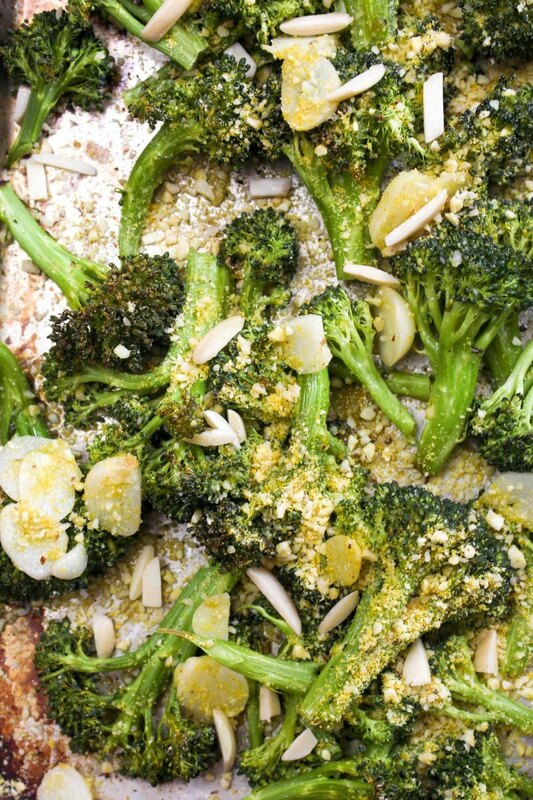 Parmesan Garlic Roasted Broccoli is a simple 4 ingredient healthy recipe that goes with any meal. The garlic flavor is unreal. Add the garlic cloves into the smallest pan you own and cover them with olive oil. Place the pan over low heat. Cook until the garlic has softened and the oil is warm. You don’t ever one the garlic to sizzle or the oil to get too hot. Remove from the heat and set aside. Spread the broccoli out onto a sheet tray and pour the oil over the top of the broccoli, making sure to get all of the garlic cloves onto the sheet pan too. Sprinkle with salt and pepper and toss the broccoli to coat. Place in the oven and roast for 20-25 minutes or until the broccoli is tender and starting to brown around the edges. Remove from the oven and sprinkle on the parm. Serve.